It seems like a such long time ago now since June when I was delighted to tell you that I'd been nominated in this year's Let's Knit British Knitting Awards. These are the largest and most high profile awards in the knitting industry, so just receiving the nominations felt like Christmas had arrived! I'm over the moon to tell you that Super Socks has won 3rd place in Favourite Book (2016)! It was up against some tough competition so I can't tell you how it feels to see my book up there with the winners - I'm still taking it in, to be honest. There's going to be an awards ceremony in October which I'm going to attend and I'll be taking lots of photos as usual so you can see what it's like. My congratulations go out to everyone who was nominated, whether they won or not and especially to the "independents" who are shaking up the yarn industry - I'm so looking forward to meeting everyone at the awards. 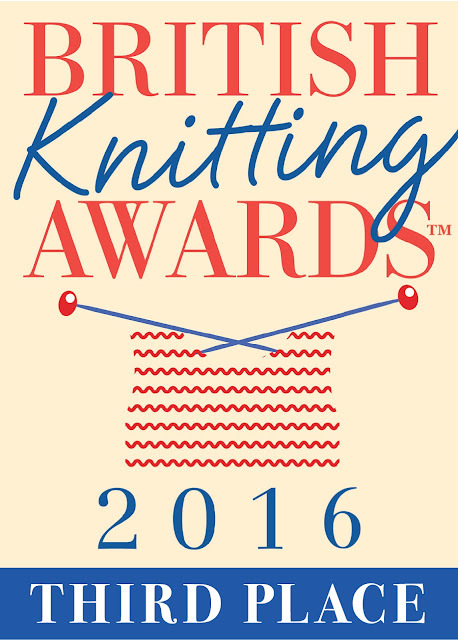 Sarah Neal, editor of Let's Knit, says "As well as rewarding familiar and established names, The British Knitting Awards also seeks to recognise small companies and lesser-known names who have made a impact on the knitting scene in their own unique way. So alongside accolades for such industry giants as Debbie Bliss, Rowan, Deramores and Stylecraft, it’s also great to see awards for independent stars like yarn producer West Yorkshire Spinners, self-published author Christine Perry and crochet blogger Lucy from Attic24. In addition to awards for chain and online stores, The British Knitting Awards also celebrates small bricks-and-mortar stores in every corner of the UK with its seven regional awards, plus an extra reward for Best Yarn Shop Day experience, scooped this year by Aberdeen-based store Wool For Ewe". Proud? I could burst right now! Great news. I just ordered the book a few days ago from Amazon and am already working on my first pair of socks and loving it. The photos are fabulous and really show exactly how it's done. Fantastic news and very well deserved, congratulations! Congratulations. You earned this recognition. I ordered my 23cm circulars from Amazon yesterday. I'm so ready to start your sock tutorial on Saturday (the promised delivery date.) I've read the blog posts numerous times, but plan to buy the book soon. Congratulations and very well done, Christine! I only wish I'd been eligible to vote for you. I've printed out the additions to your book and have them carefully tucked away inside my copy. It's a wonderful resource and reflects its author's care for her craft and for those of us trying to follow along. Excellent, Christine. I can't tell you how helpful your book has been to me. I always wanted to knit socks and have bought many "how to"s but until I found your blog, book and boards I didn't have the confidence to start. Now I'm loving the hand knitted sock life! Thank you so much and your recognition is well deserved! Yay!! Well done you, Christine - that's fabulous news. It's thanks to you that I'm now a sock knitting nut......and loving it!